In a major victory for libraries and public access to great literature, the Israeli Supreme Court this week issued a ruling concluding an eight-year legal battle about ownership of the literary works and letters of Franz Kafka. The series of court cases between Israel and the heirs of Max Brod, executor of the estate of Prague-born writer Franz Kafka began in 2009. Kafka’s last will and testament transferred all of his manuscripts to Brod after his death in 1924. A March 2015 article The Betrayed(?) Wills of Kafka and Brod by Nili Cohen, 27 (1) Law & Literature 1 (available to Brooklyn Law School Library users through a subscription to the Taylor & Francis Online Journal Library) relates that Kafka in separate letters entrusted his manuscripts and works to Brod instructing him to burn them after his passing. Brod did not honor Kafka’s request and took the papers with him when he fled Czechoslovakia in 1939 and emigrated to Palestine. After the 1968 death of Brod, his will bequeathed the papers to his secretary Esther Hoffe with instructions to give them to the “Hebrew University of Jerusalem, the municipal library in Tel Aviv or another organization in Israel or abroad”. Instead Hoffe kept the papers and shared them with her two daughters and even began to sell them. In 1988, Hoffe sold an original copy of Kafka’s The Trial for $2 million. The 2007 death of Hoffe, more than 80 years after Kafka’s death, touched off a lengthy court fight between Israel and Hoffe’s daughters who claimed the papers were given to their mother by Brod so she could dispose of them as she wanted. The WSJ Law Blog reports that Hoffe’s daughters refused the Israeli government’s demands to hand over the documents. The case turned on questions of inheritance law and whether Hoffe was entitled to give instructions about Brod’s literary legacy in her will. “Max Brod did not want his property to be sold at the best price, but for them to find an appropriate place in a literary and cultural institution” Israel’s high court stated in its opinion in which it directed that the papers should belong to the National Library of Israel in Jerusalem. Both Kafka and Brod studied law in Prague’s Karl University and Kafka devoted much of his literary work to the law. His letters to Brod to destroy his manuscripts was not a binding legal document as they included neither the title “Will” nor a date, suggesting that Kafka intended to ask his friend to honor a moral, not a legal, obligation. Kafka’s uncertain attitude towards law is expressed in his greatest novel, The Trial, which he wrote from 1914 to 1915. The novel was published in 1925 after Kafka’s death. 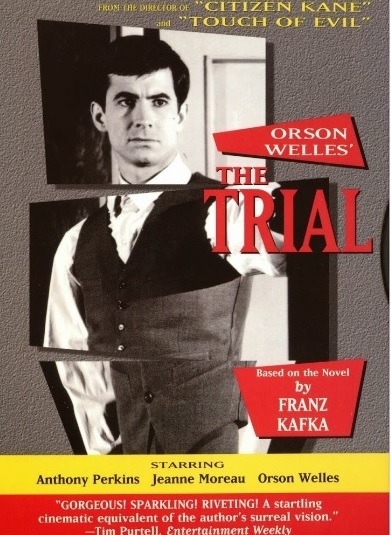 Years later, Orson Welles wrote a screenplay based on the novel and directed the 1962 masterpiece The Trial (Call No. PT2621.A26 T75 1998) which the BLS Library has in its video collection. The story centers on the main character, Josef K, who wakes up one morning to find the police in his room. They tell him that he is on trial but no one tells him what the charges are. His efforts to learn the details of the charges and to protest his innocence remain fruitless. As he tries to look behind the facade of the judicial system, he finds he has no way to escape his nightmare. Written by: Harold O'Grady on August 10, 2016. This entry was posted in E-Resource, International & Foreign Law, Legal History, SARA Catalog, Uncategorized on August 10, 2016 by Harold O'Grady.